When most people think of long-term care, they think of nursing homes. But that's simply not true. If you can no longer care for yourself for an extended period of time, you’ll need long-term care services. There's a 70 percent chance that will happen to you. But did you know a suitable policy could be funded without impacting your household budget? It's about finding the solution that works for you. While it may seem like there are many programs available, Medicare only covers skilled care after hospitalization and Medicaid requires impoverishment. Will your spouse be physically able to assist you with daily living activities, such as moving from bed to chair, bathing and dressing? Are your children able to take time off to provide the daily support you may need? There may be a large negative impact of this strategy – both emotionally and financially. With proper planning, you can take control of your future. It's not one-size-fits-all ... there are numerous solutions that can work. It's important to evaluate your choices and find the option that works for you. Don't wait until it's too late! Get in touch with your financial advisor today and ask how to secure your future. Discover all the ways Ash's LTC team makes it easy for you to offer long-term care as a solution for clients! Help your clients know the facts about long-term care so they can make solid decisions about protecting their assets. 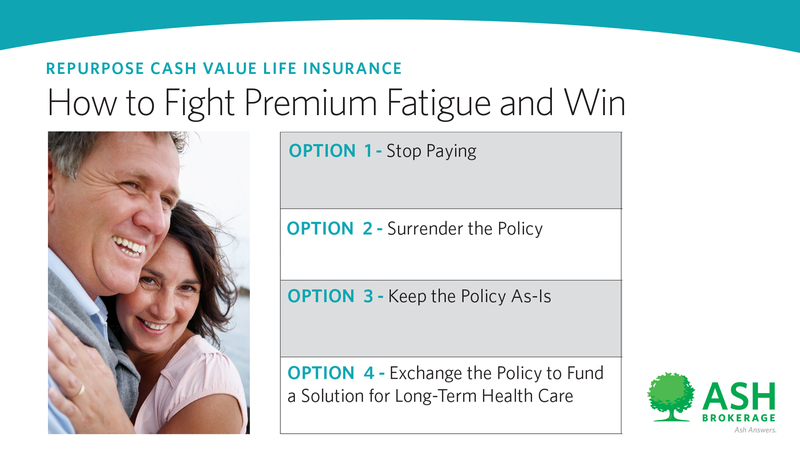 Premium fatigue doesn’t have to end in frustration. Give clients a solution that makes better use of their assets and helps calm fears about the future.